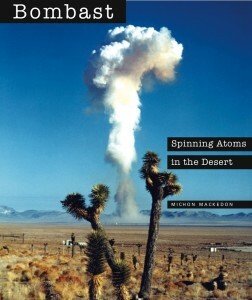 Michon Mackedon has been scheduled to speak about her book Bombast: Spinning Atoms in the Desert on Saturday, June 30, 2012, 2:00 PM at the Nevada Historical Society in Reno. This chapter meets on the 2nd Thursday of every month at 1:00 p.m. at Fernley City Hall, located at 595 Silver Lace Blvd. Michon Mackedon will speak about her book, Bombast: Spinning Atoms in the Desert in June, for the Carson City Rotary, at the Carson Nugget Casino. Thank you, Martin J. Pasqualetti and the American Geographical Society for the wonderful review of Bombast: Spinning Atoms in the Desert in the Geographical Review journal. Wednesday, March 7, 3 – 5 p.m.
Nevada Today, Events @ Nevada. 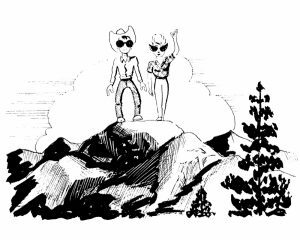 In conjunction with the current Special Collections exhibit Where the Sage Meets the Sky: Great Basin Landscapes, join us for a series of “Sagebrush Conversations” as local experts and authors discuss Nevada’s physical and cultural environment. Discussions on this date will be on “Photographing and Mapping the Black Rock Desert” with Peter Goin, UNR Professor & Chair, Art Dept., and Paul Starrs, UNR Professor & Chair, Geography Dept. Peter Goin and Paul Starrs co-authored Black Rock in 2005, each bringing to the volume their professional strengths. 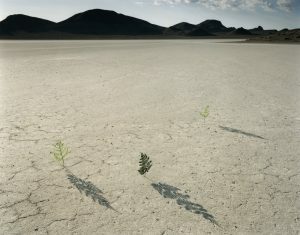 Peter will discuss his photography for the book and Paul will cover the geography of this most historically important northern Nevada desert. This review is from: Bombast: Spinning Atoms in the Desert (paperback). Mackedon is one of a growing number of Nevada poets, novelists, artists and scholars who are recording the nuclear history of the state and nation. Her approach is far-ranging and her book particularly accessible. It is filled with scholarship but is a popular rather than an academic book. An added advantage for busy people is that this book can easily be browsed; each chapter or section can stand alone, and many pages are illustrated with quotes, drawings or sidebars with interesting information. The 23 page full-color chapter on Atomic Pop draws on the extensive collection of artist Peter Goin who was also involved in the artistic design of the book. In short, this is a unique book that draws on Mackedon extensive research of government documents, her service as Vice-chair of the Nevada Nuclear Commission, her rhetorical skills as a Professor of English, and her personal perspectives as a Nevada native. Black Rock Institute is pleased to announce that Bombast Spinning Atoms in the Desert has been chosen as the winner of the Indie Excellence® Awards 2011 in the category Regional-Non-Fiction. And a silver award from the 2011 Independent Publisher Book Awards in the category West-Mountain – Best Regional Non-Fiction. David Stentiford teaches developmental writing at the University of Nevada, Reno. To spin the atom in the Nevada desert, explains Michon Mackedon—to get people on board with nuclear testing and repository sites—is much more than a scientific endeavor: it’s an art that requires data, predictions, and places to be stitched together with just the right influential language. Part commentary, part rhetorical analysis, “Bombast: Spinning Atoms in the Desert” tells the story of nuclear events related to the Nevada Test Site and the Atomic Energy Commission (AEC). The book also explores terrain beyond the NTS to analyze language, cultural artifacts, and other nuclear events that contextualize Nevada’s role as the nation’s principal atomic weapons testing site and, at one point, the potential repository for the country’s high-level radioactive waste. 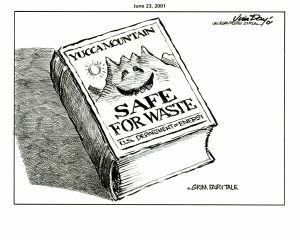 Mackedon, who for twenty years served as a member and vice chairman for the Nevada Commission on Nuclear Projects, tells us how the Nevada Test Site (NTS) and Yucca Mountain were promoted through clever “imagery, euphemism, and promotional rhetoric” that emphasized the naturalness of radiation, touted the clean safety records of tests, characterized the desert as a wasteland, and leveraged the language of “sound science” to achieve questionable ends. This “sound science,” the book argues, masked political interests, and aesthetic and sociological assumptions about Nevada. Michon Mackedon, retired professor of English and Humanities at Western Nevada Community College, talks about her recent book, Bombast: Spinning Atoms in the Desert, about the history of nuclear testing in Nevada.